Many climates are extreme enough to require the use of a greenhouse. They can also be beneficial for gardeners who want to extend the season. A greenhouse can enable you to get your plant starts in early and ripen vegetables which have longer seasons. It is possible to garden in a greenhouse all year long. Size is one of the major decision concerning you greenhouse purchase. Consider your budget and get one to fill the intended location. Don't overlook possible heating and ventilation requirements for your project. These will be very important aspects of your success. Greenhouse have become more affordable in the last 5-10 years. Forget the weather outside and grow vegetables, herbs and flowers with your new greenhouse. Modern structures are created long-life plastics, wood, metal or glass. 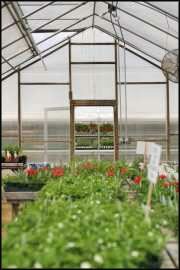 A quality greenhouse should last for an extended amount of time with the proper maintenance. We recommend the kits that are available through various sources. Garden stores can be a great place to find pre-fab greenhouse kits and plans for sale.